An Epic Adventure in Mecha Clothing. I'm not a huge fan of Mecha. Actually, there's only maybe one proper Mecha anime I like. If you include Eureka Seven, that makes two. This series is very unique, and very powerfully done. I think it's an amazing story that is a joy to watch. But, make sure you watch the English SUBS. For some reason, the English Dub decided to use a lot of flowery metaphors to replace the names of things that could've been described very easily, and if you miss a single five minute portion of each video, where these things are named or alluded to, it'll be super confusing. The Sub is just better in that regard. Though, the voice actors for the Dub are pretty good. Came for the good times, stayed for it's flaws, and it's still amazing. Eureka Seven is one of those curious cases where it's short-comings actually help in its favor. There are a few things that could irk someone, like how confusing Gekkostate's mission is, the fact that the villain is utter shite and pulls a dues ex machina out of his rear, or how the characters just sorta pull info dumps outta nowhere which would have helped earlier. Despite all those grievances, it still manages to keep you invested and entertained. With it's character dynamics, it's setting and world, and, of course, that of Eureka and Renton and their blossoming love for one another. One of the show's biggest plot points is that of the main leads' relationship with one another, and it's themes of "learning to love someone despite their flaws." Eureka and Renton embody that so well and easily, as do several others, and you (the audience) sort of allow yourself to love the show for it's ups and downs, for better or for worse. It's a flawed show that I ended up loving because it's flawed, almost like it's a person. Definitely do watch this if you get the chance. This anime was fantastic. It has great character development, great romance, a great story, amazing animation -it doesn't seem like it was made in 2005/2006- and, good music that goes well with it. The pacing was good, maybe a little slow at times, but didn't bother me. The ending was satisfying, but did leave a couple questions. It left me wanting more. It does have a season 2 but with different characters. It does however answer some questions. I have not watched it and I don't think I will. It was quite poorly received. I will however watch the movie trilogy that is coming out. They will feature a telling of the events before the original series, a retelling of the original series; with new animation, voice acting, scenes, and a new original ending. This one was fairly well done. Good cast of characters, good story as it all starts coming together, and the whole world has a really interesting vibe to it. Like "rebel commando hi tech robot surfer piloting along a psychadelically groovy wave course of tears", if that makes any sense at all. Gets kinda slow in the middle and got a little tired of the whole "Poor me I have no self confidence" thing, but they pulled it together right there at the end in such a way that was so corny it was good. Worth watching. Recommend Eureka Seven to all! I'd so recommend this show to any of my friends. 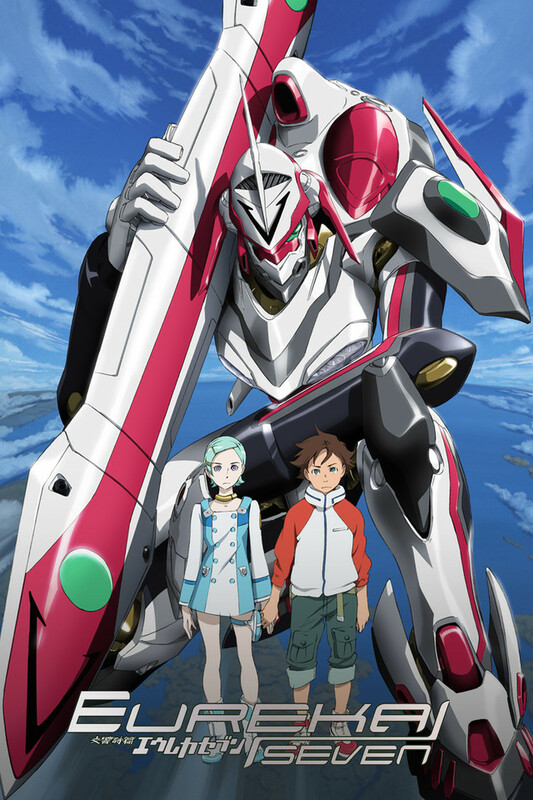 Eureka seven is an epic mecha anime, the in's and out's in the past's of the main characters, the mecha's; called IFO's are very detailed, in both how they surf and how they move. A few dynamic action scenes to wrap the viewers around the plot are well placed. The ending is a small let down, as we don't really have any indication what happened to Renton and Eureka aside from a short cut scene and the later plot of Astral Ocean. All in all, I do give this show a 5 star rating and do recommend that you watch it. If you look at this show for just the romance and the character development, then this show is easily a 5/5, but seeing as I gave it a 3/5, I will need to explain myself and please take into consideration that this review is based on my tastes and my personal opinion. As stated, the show started off strong, really strong. The characters were amusing and enjoyable, the art was great, the story and the world building was tremendous (One of my favorite aspects of the shows). I loved the idea of trapars, waves of the sky, and was curious as to what the show had more to offer. I was really worked up and then it fell apart. Without getting into spoilers, the show became a mess of confusing things, like something that is EXTREMELY important to the show in the later episodes was never mentioned in episodes prior. The ending was bittersweet. It was good but also disappointing. I would recommended this show to those who want a love story and great characters but if you are looking for a great general story, then this show doesn't fit the bill. Eureka Seven is in my Top 10 of anime to introduce people to! It is such a great show and not too long running! Eureka Seven keeps you on the edge of your seat and every episode leaves you wanting more. It has action, comedy and even pulls the chords of your heartstrings. I have personally re-watched this series several times and I love it even more each time. It has every aspect of a good, entertaining and quality anime.